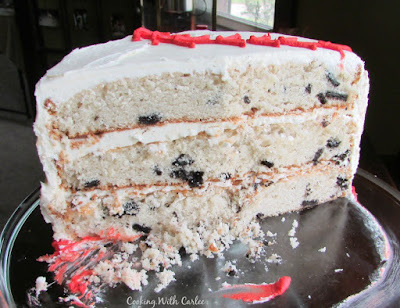 This cake is three deliciously easy layers of cake dotted with your favorite chocolate sandwich cookies for the perfect cookies and cream cake experience. You are going to love how easy it is almost as much as you'll love the results! When planning my sister's baseball themed baby shower, we had all sorts of cute ideas. Of course we had plenty of sweets in mind too. But it seems like a shower needs a cake, am I right? So I knew I had to make her something fun. She is a huge fan of things like dirt pudding, so much so that she had me make some in mason jars for her wedding dessert table! So I thought a cookies and cream cake would be perfect. I poked around for some recipes, but a lot of them started with a cake mix. Not that there is anything wrong with that, but I have been making so many homemade cakes lately that I couldn't switch to a mix for something as important as my little sister's shower. The rest of the recipes I found were for white cakes that just used beaten egg whites. Now usually I don't mind beating some egg whites if there is a good cake or meringue waiting for me on the other side. But sometimes when I am up to my ears in party planning, that extra step is just a little too much for me to handle. I can't be the only one that gets to stat stage, can I?! That's when I remembered back to the haleakala cake I made last year for my grandpa's birthday. It was really moist and tender and seemed like it would be a good vehicle for some cookies and cream action. Plus while it calls for egg whites, they don't need to be whipped separately. So I tinkered with the recipe and expanded it a bit, of course! Two layers were fine for the haleakala cake since it had so much filling and fluffy frosting. But seeing as I was just frosting this one, I like the proportions better when there are three nice layers of 9" cake. Besides, it's more cake! So that was decided. All I had to figure out was the frosting. It didn't take me long to decide on some white chocolate buttercream. 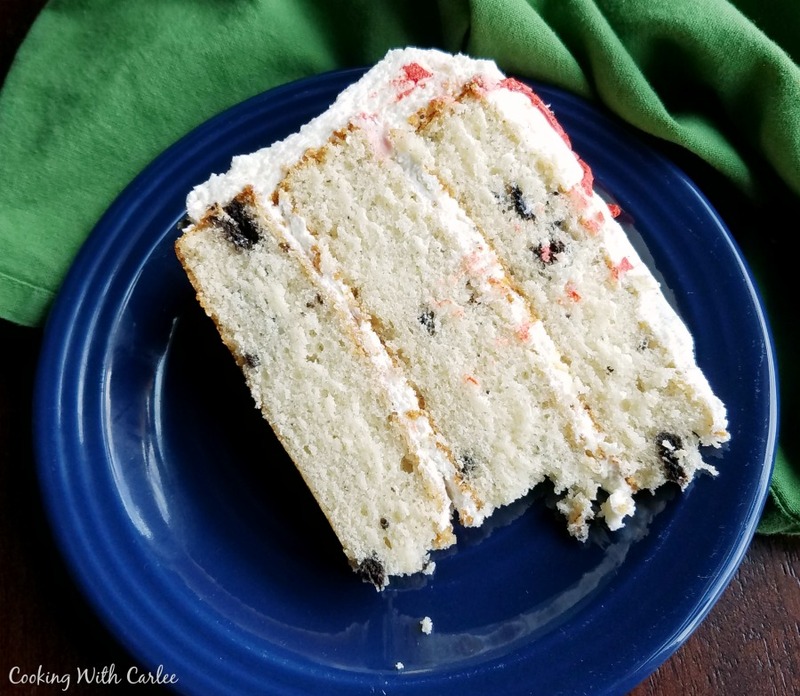 The proportions of that recipe are perfect for a nice tall cake like I had in mind, the flavor is great and it is so smooth and creamy. I thought it would play really nicely with all of the Oreos and creamy cake. I have to say the results were pretty darn amazing! It held up nicely to serving and went down pretty easily. I am also a pretty big fan of anything cookies and cream, so this is not likely to be the last time I make this cake. Now I just have to manufacture a good excuse to throw another party! Stir together the flour, baking powder and salt with a whisk to ensure no clumps. Set aside. In your mixer bowl, cream the butter until smooth. Add sugar and vanilla and beat until completely incorporated. Be sure the scrape the sides and bottom of the bowl. Add half of the dry ingredients, mix on low until incorporated. Scrape the sides of the bowl and then add half of the milk, again mixing on low until incorporated. Repeat, adding the remainder of the dry ingredients and then the milk. Scrape the sides well. Add the egg whites (you add them unbeaten) and beat batter on high for 2 minutes. 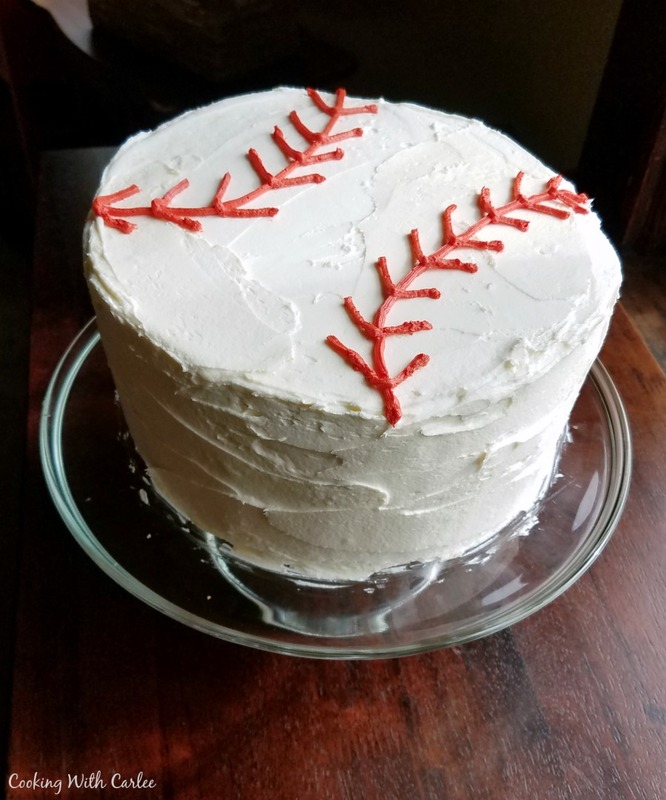 It is ok if the final batter isn't completely smooth. Fold in crushed sandwich cookies. Pour half of the batter into each of the three prepared pans. Tilt them a bit to level out the batter, and then drop them from a few inches above the counter to finish leveling them. Bake 30-35 minutes. The sides should have pulled away from the edges and the top should be golden brown and barely spring back when pressed with a finger tip. Run a knife around the edges of the cakes when you remove them from the oven, then let them cool for 5 minutes in the pan. Invert onto a cooling rack and then cool right side up until completely cooled. I'm afraid you got the not wanting to beat the egg whites thing from your mom. I usually avoid recipes with that as a step. For me it's the folding them into the other ingredients that gets me. I really don't mind it most of the time, but sometimes it is too much! I love that you don't have to go through the effort with this recipe and you still get a great cake. It's hard to go wrong with cookies and cream! I love cream cake !! I can't wait make !! Thanks for your sharing !! Your Cake looks fantastic! Hope you have a great 4th of July weekend and thanks so much for sharing with us at Full Plate Thursday! What a perfect birthday cake!! Oh my goodness! I've had that happen to me a few times on other blogs too, but I've never tried the button here. I would imagine there is an unsubscribe option at the bottom of the email. Can you try clicking that? Saved as a favorite, I love youｒ website!